The IPL 2019 Purple Cap is swapping owners fast between Delhi Capitals’ Kagiso Rabada and Chennai Super Kings’ Imran Tahir. Earlier, on Sunday, Tahir overtook Rabada following a four-wicket haul against Kolkata Knight Riders (KKR). However, later in the day, Rabada won the Purple Cap as he scalped a four-wicket haul as well against Sunrisers Hyderabad (SRH). Rabada now leads the highest wicket-takers list with 17 wickets followed by Tahir’s 13. You can check out the updated IPL 2019 most wickets list below. IPL 2019 Orange Cap Winner Updated. Indian Premier League 2019 kicked off on March 23 and continued till May 12. The bowler with most wickets throughout the IPL 2019 will don the Purple Cap to signify that he is the highest wicket-taker. At the end of the season, the bowler with most wickets against his name will be awarded a special memento. In the last season of IPL, it was Kings XI Punjab bowler Andrew Tye who took away the Purple Cap for claiming the highest number of wickets. The Australian claimed 24 wickets by the end of the IPL 11 to keep the Purple honour. IPL 2019 Schedule in PDF: Download VIVO Indian Premier League 12 Full Timetable With Fixtures, Matches, Team and Venue Details. Other previous Purple Cap winners are: Bhuvneshwar Kumar (SRH) with 26 wickets in 14 matches of IPL 2017; Bhuvneshwar Kumar (SRH) with 23 wickets in 17 matches of IPL 2016; Dwayne Bravo (CSK) with 24 wickets in 16 matches of IPL 2015; Mohit Sharma (CSK) with 23 wickets in 16 matches of IPL 2014; Dwayne Bravo (CSK) with 32 wickets in 18 matches of IPL 2013; Morne Morkel (DD) with 25 wickets in 16 matches of IPL 2012; Lasith Malinga (MI) with 28 wickets in 16 matches of IPL 2011; Pragyan Ojha (DC) with 21 wickets in 16 matches of 2010; RP Singh (DC) with 23 wickets in 16 matches of IPL 2009 and Sohail Tanvir (RR) with 22 wickets in 11 matches of IPL 2008. Most Wickets in IPL 2019- Purple Cap: The highest wicket-takers of each of previous ten IPL editions have been Pakistan's Sohail Tanvir of Rajasthan Royals (IPL 2008), India's RP Singh of Deccan Chargers (IPL 2009), India's Pragyan Ojha of Deccan Chargers (IPL 2010), Sri Lanka's Lasith Malinga of Mumbai Indians (IPL 2011), South Africa's Morne Morkel of Delhi Daredevils (IPL 2012), West Indies' Dwayne Bravo of Chennai Super Kings (IPL 2013), India's Mohit Sharma of Chennai Super Kings (IPL 2014), West Indies' Dwayne Bravo of Chennai Super Kings (IPL 2015), India's Bhuvneshwar Kumar of Sunrisers Hyderabad (IPL 2016) and India's Bhuvneshwar Kumar of Sunrisers Hyderabad (IPL 2017) and Andrew Tye from KXIP bagged the Purple Honour last year in IPL 2018. The T20 format is known for tall sixes and fours. But one good over from a bowler can change the result of the game. There have many instances where the bowlers have snatched victories from the jaws of defeat. Like in T20Is, even in the IPL, a bowler can bowl a maximum of four overs in the game. Therefore, every bowler looks forward to giving his best in the given spells. 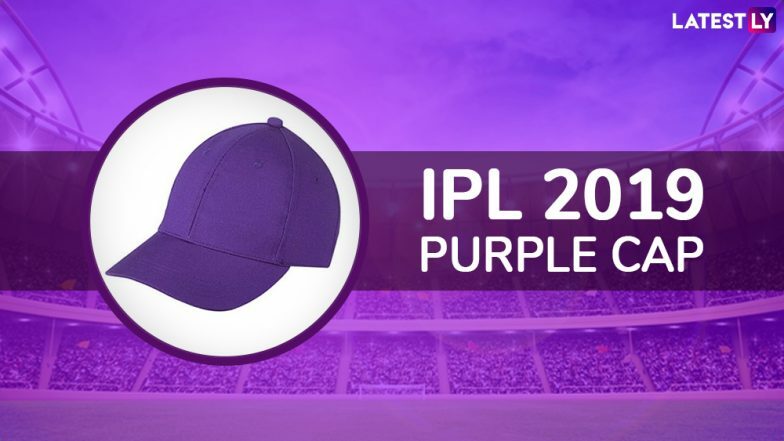 Stay tuned to know who will be the Purple Cap winner this year in IPL 2019.